Well the summer tourist season has drawn to a close. It was another spectacular summer in the Jackson Hole area, and throughout Yellowstone. But not all travelers have left and there certainly are locals still in the area… so what is there to do in Jackson during the fall shoulder season? Well, there is a lot to do. Goosewing Ranch closed to guests on September 23 for the 2012 summer season, but we are still at the ranch finishing projects and already preparing for 2013. Without all the families on the ranch to take horseback riding we have some down time to really enjoy the Greater Yellowstone ecosystem. 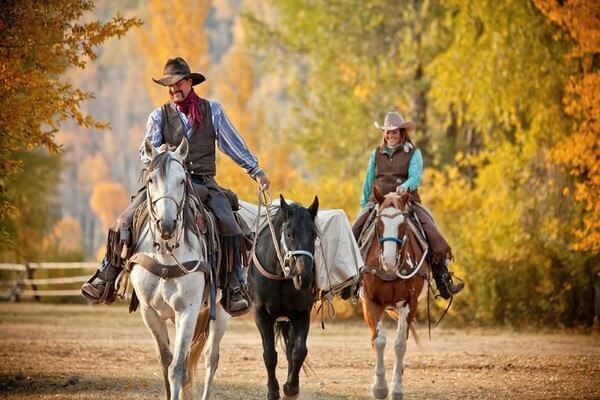 Hunting, fishing, hiking, and great deals are just a few of the things you can experience in Jackson Hole Wyoming during the autumn months. Flights into Jackson Hole Airport are usually a little less expensive and all restaurants and hotels are offering discounted rates and deals. The area itself is beautiful also. The aspen trees are in full color, and the wildlife is abundant whether you are shooting them with a camera, bow, or riffle. Hunting is a big part of our local economy and it brings many thrill seekers to the area. Contact a local guiding service or check out grosventrehunting.com for more information. Yellowstone and Grand Teton National Parks also offer great touring opportunities. With fewer tourists in the area you can travel through the parks with ease. This is also a great time of year for hiking with cooler temps and spectacular views, but remember the wildlife is preparing for winter so tread with caution. Fishing is still excellent also. The steams are easily accessible and the trout are hungry. With temps ranging for 65 degrees during the day down below freezing at night you will want to pack a variety of options. But get out and enjoy the spectacular weather the autumn in the Tetons brings. Make sure you check local listings for off season hours and specials, and also check with the local parks because each entrance and most venders have different dates of operation. Remember not all of Yellowstone and Grand Teton National Parks are open all year. If you like cooler weather, great deals, fall colors, small crowds, and lots of wildlife and scenery viewing then checkout the Jackson Hole area. Most of the people in the area this time of year are hunters, locals, and singles or couples so pack a bag and enjoy the off season touring the Tetons. I know those of us at Goosewing Ranch and in the Gros Ventre LOVE this time of year!